← Do they play cricket in China? The next meeting of the Ulysses Reading Group is on Sunday 24th March at 7.30pm in Muir Court. We are continuing where we left off in the Eumaeus episode from He made tracks heavily, slowly with a dumpy sort of a gait to the door. 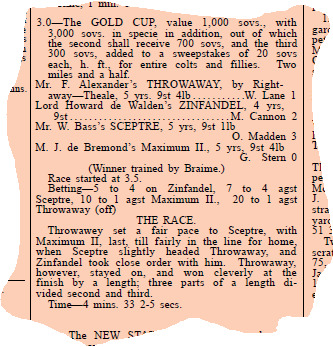 Later Bloom happens upon a copy of the Evening Telegraph with the result of the Ascot Gold Cup.